Marsh & I sat down to re-evaluate our budget. It seems like we have to do it often because after a month or two, we start bending it. Does this sound familiar to anyone else? Anyways, I've been doing The Grocery Game for a little over 2 months to try to build some food storage and save on our groceries. 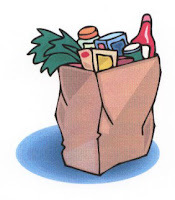 I've been saving about 60-70% on our groceries, and have noticed I've been able to get soooo much more for our money, and have stockpiled our linen closet and a lot of different foods. My family and anyone that knows me well, knows that I thrive on an awesome deal, it's a game for me and I love it. I've seen this challenge around and thought I would try it for the month of April. Basically you try to feed each person in your family for $10 a week. This would be a big cut for us. I grocery shop once a week and we budget around $70 a week, so about $280 a month for groceries. If I do the challenge this month, that would mean $160 for the month. I can't believe it would save us $120! And the catch is - you can't just eat Ramen and Macaroni and Cheese all month. You have to do balanced meals. We are guilty also of liking to eat out. So another rule: We can only eat out one meal a week, and of course we have an allotted budget for that as well. Some may think it's different since our boys are little, but you'd be surprised how much they can eat. Granted, it's not the same as my 12 year old nephew who can pack away the food, but they eat a considerable amount considering how little they both are. I'll check in once a week to let you know how we do. Is anyone else up for a challenge? We eat out too much as well. it sounds interesting, the challenge and I would have to see if Joe is up for it. He tends to spend money when he is working since it depends on what his field training officer wants to do for dinner. I think I will recommitt and make a goal not to eat out this month. That is a hard one ,we always seem to do fast food after swim, since it is easy. I think we will start packing a lunch to eat immediately after swim practice. In Arizona we have Coupon Sense and I love it. I get 3 Sunday papers for all my coupons. I think the grocery games is pretty similar. I really should try this game.. My groceries average $700 or more a month.. GASP! I have never cut coupons but now is a good time! I could save a bundle to start off if I just stayed away from the fast food and the junk food. We are going to try it too. We wanted too list you as referring us to the site but didn't know your email address. Looks like you are finding some great deals. I'm sad cause our paper stopped inserting P&G and Red Plum coupons. I haven't gotten free shampoo in like 3 months!Did you see alberston's had "double your coupon" coupons. Those are the best!